While the EU has stopped fisheries partnership in Guinea due to violence in the country, the EU continues to pay Morocco to fish in occupied Western Sahara. The European Community and the Republic of Guinea concluded a fisheries agreement covering the period 1 January 2009 to 31 December 2012, and the vessels have been fishing since January 2009. In October, however, the EU-Guinean cooperation suddenly stopped. The agreement would have allowed the Community’s vessels from mainly Spain, Italy and France to fish offshore the Guniean waters. In return, Guinea would receive up to 1,050,000 Euros yearly for development of their fisheries industry and to improve surveillance. Read more about the agreement on the EU’s homepages. However, in September, the Guinean armed forces used violence against its own citizens in a peaceful demonstration, killing over 150 and wounding over 1200. This changed the opinion in the EU. Following a vote on the report of the European Parliament’s Fisheries Committee of 1 October, rejecting the draft agreement for an EU-Guinea fisheries partnership, the Council of fisheries ministers, meeting in Luxembourg on 20 October, asked the European Commission to launch procedures for the withdrawal of the proposal, writes Europolitics.info. “While the Parliament’s opinion was not binding, it was convincing enough for the Council and the Commission to fall in behind,” wrote Europolitics. 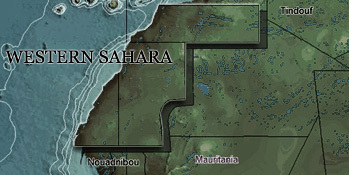 The fisheries continue, however, offshore Western Sahara. The EU is paying the Government of Morocco to fish in a territory which is not Moroccan, but which is under occupation. Sweden, which holds the current Presidency of the European Council and voted against the agreement in 2006, stated the EU fisheries in the territory is in violation of international law. Leading law experts are of the same opinion. While Morocco rejects to decolonise the territory, severe human rights violations are committed against those who demand self-determination.